Tomatoes - Let's be candid, most tomatoes from the supermarket are hard and tasteless; they don't add much to a BLT. But if you use a homegrown tomato, you have an entirely different experience because the sweet of the tomato compliments and balances the salty-fatty taste of the bacon. If you are like us, you now have an abundance of amazing tomatoes from your garden. 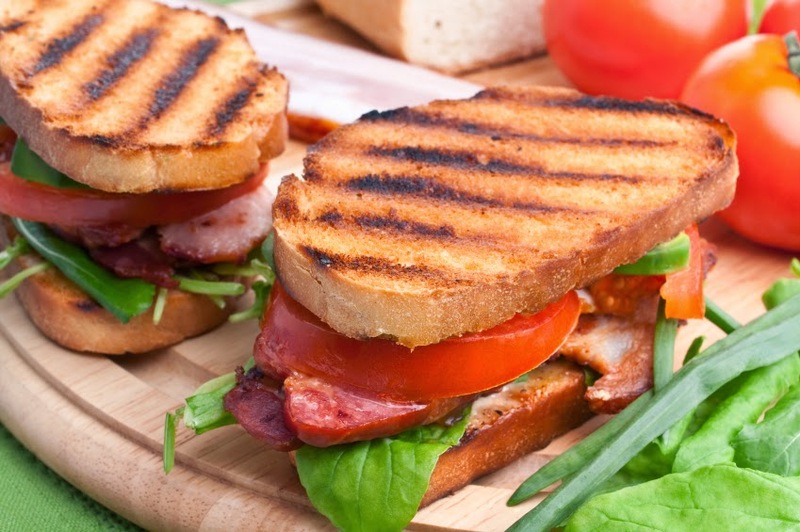 Use these and your BLT just improved ten fold. If you don't have homegrown get them at the farmers market or local farm stand. 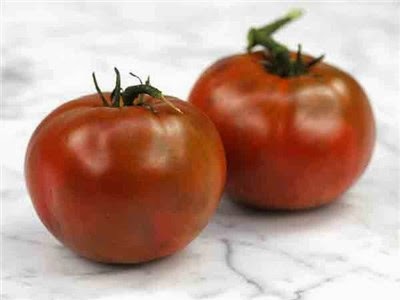 Our favorite tomatoes varieties are Paul Robeson, Japanese Trifele and Brandywine but get what you like. 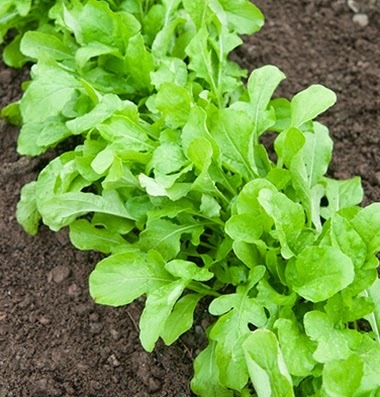 Lettuce - you can use any variety in your garden, but we tend to like greens that are a bit spicy. 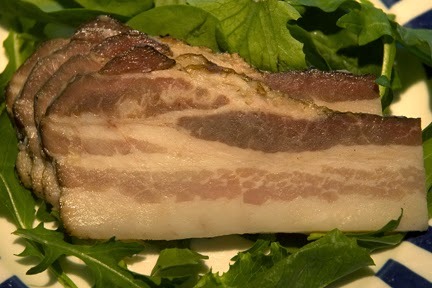 The adults in the family generally use arugula in place of lettuce, but for the kids we use a wonderful sweet variety called Jericho. I suppose a Bacon, Arugula and Tomato sandwich should probably be called a "BAT" not a BLT but it works for us. The Staff of Life - You can use white bread to make BLT's, but a tastier approach is to use a fresh baked bread like a ciabatta, batard or boule. Don't worry if you don't recognize these names; they are just different styles of bread with crusty tops similar to French bread. We buy our bread at our from the store because we've found that commercial bakers do a better job than what we can at baking these loaves. High quality, fresh bread is becoming more widely available these days and many of the better supermarkets now bake it on the premises or source it from a local artisanal baker. If you have the option, use a nice crusty top bread to make your BLT's. Mayo - Slather it on. Yes we know it high in fat. For Pete's sake, live a little. Warm blooded animals regulate their body temperature through a process called evaporative cooling. For us humans, the primary means of keeping our body temperature under control is by sweating. Specifically, the brain triggers a response that causes our pores to release water molecules that then pool on the surface of our skin. These water molecules are in constant motion and the relative speed of their motion is directly related to their temperature. Sweat is relatively hot water and so the water molecules that form on the surface of our skin are ones that are moving rapidly compared to the external environment. In fact, these water molecules are moving so quickly that they bump into one another and some are propelled off the surface of the skin in the form of water vapor. When this happens, the evaporating water molecules literally carry their heat with them into the air leaving the skin cooler. Chickens also use evaporative cooling to rid their bodies of heat, but the evaporative cooling is accomplished in a different way. Chickens lack sweat glands, so they drive off excess heat by evaporating water located on the surface tissue of their lungs. Anyone who has ever owned a dog will immediately recognize how this is accomplished because dogs and chickens both cool themselves by panting. Air is drawn int the chickens lungs where the heat exchange is accomplished and then the chicken exhales the warm moist air, thereby lowering it's body temperature. Check out the below video of one very hot chicken. A chicken's body temperature is normally around 107 degrees Fahrenheit. A chicken can usually regulate it's body temperature effectively as long as the outdoor temperature is ten degrees below body temperature. However, once the outside temperature climbs above 95 degrees, a chicken runs the risk of heat stress. 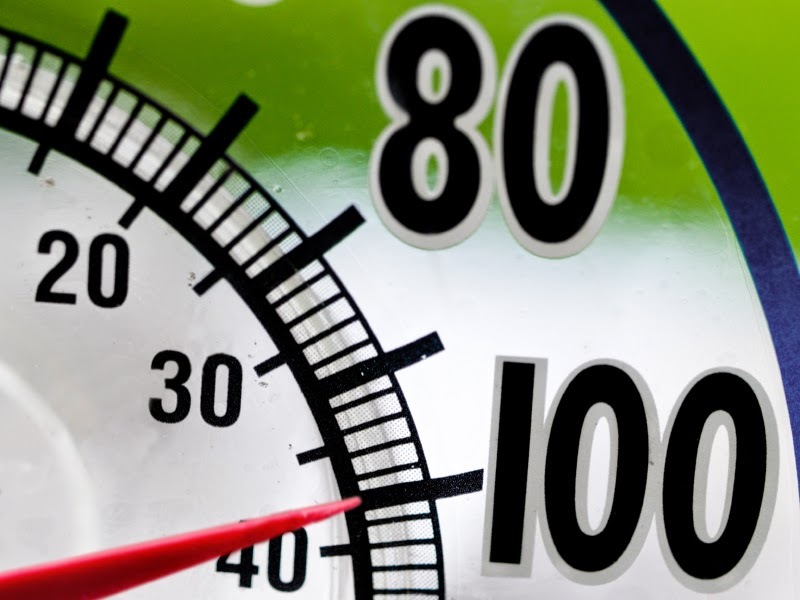 The risk is even higher on humid days because evaporative cooling becomes less effective. This is because humid air is so saturated with water that it is becomes difficult for the chicken to transfer water within its lungs to the air. 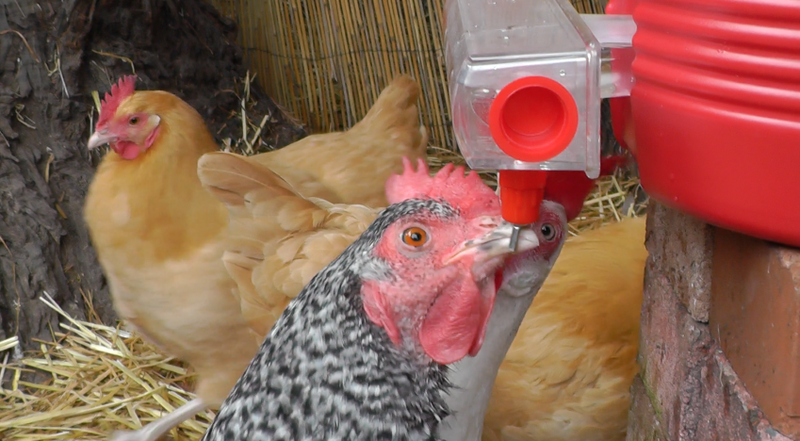 To help prevent heat stress and dehydration, make sure you give your chickens plenty of cool water. This is your first and most important line of defence. 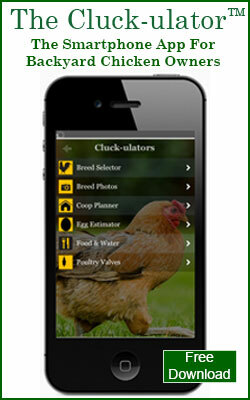 Supplement your chickens normal dry feed diet with , moist foods. Tuna fish, green vegetables and fruits etc. A number of chicken owners I know will actually give their chickens a chilled watermelon on very hot days. 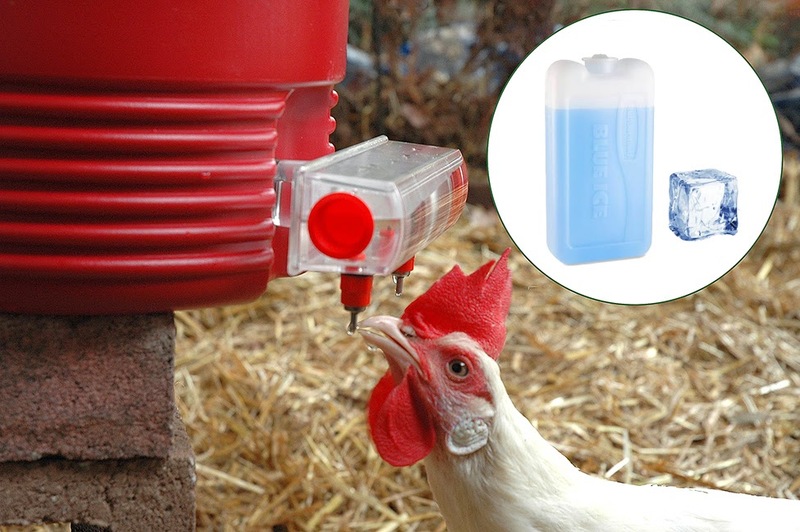 Add electrolytes to the water - Electrolytes are minerals that help a chicken replace and retain fluids. 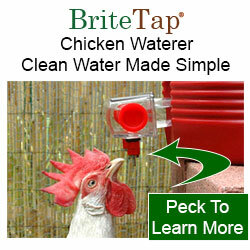 You can buy premade electrolytes for chickens from your local feed store or mix your own. 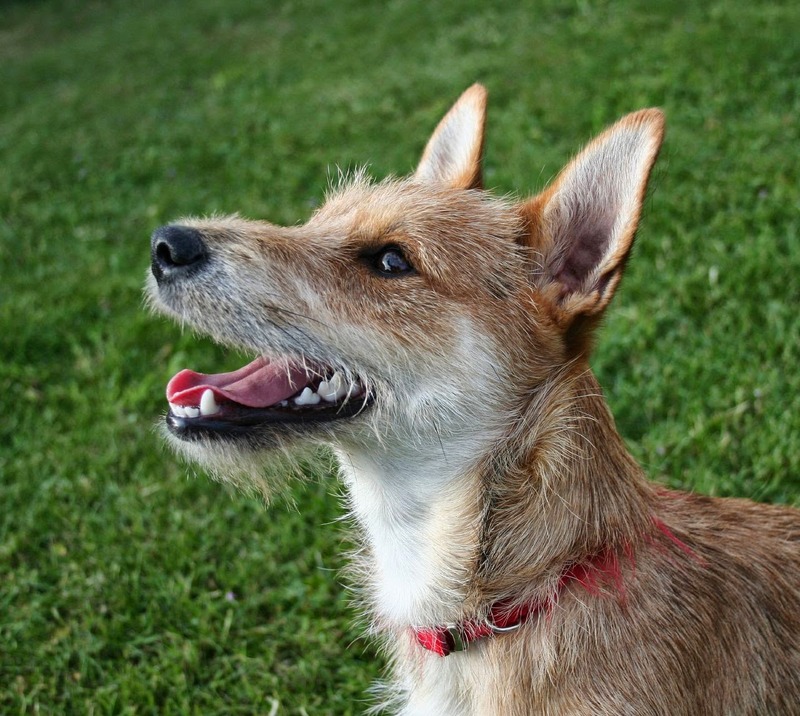 In her book, The Chicken Health Handbook, Gail Damerow provides the following recipe for a home brew electrolyte solution: 2 quarts water, 1/2 teaspoon potassium chloride (salt substitute), 1/2 teaspoon backing soda, 1 teaspoon table salt. The dog days of summer are here making life uncomfortable for both people and chickens. Heat can place stress on chickens, so don't be surprised if you see a drop in egg production during the summer. Although you can't control the weather, there are some things that you can do to keep your chickens comfortable and safe during these hot days. 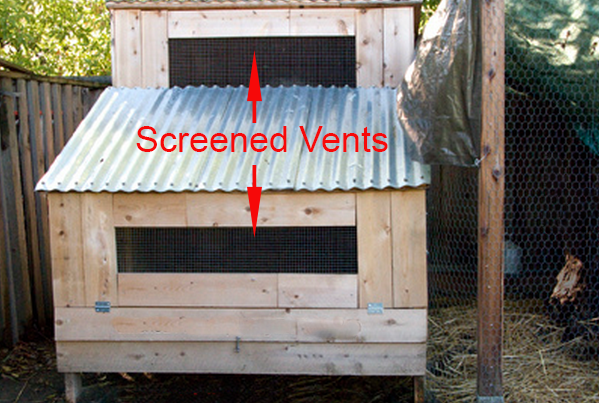 Ensure Ventilation - Hopefully, you've built your coup with windows that allow you to increase ventilation in your coop. If this is the case, make sure that the ventilation windows are wide open during the summer. If you plan on leaving the windows open during the evening, make sure that the windows themselves are covered with durable screening to keep out any predators that may be roaming around your property during the evening. If you are in a particularly hot environment like Texas or Arizona, you may also want to invest in a small fan to help drive hot-air from your coop. However, please note that chickens do not sweat and, therefore, don't benefit from having air blown over them directly. The purpose of the fan is to keep heat from building up inside the coop. Provide Shade - If there are no areas in your chicken run or backyard where chickens can go to escape the heat of direct sunlight, we recommend that you set up a sunshade for them. You can construct a shade with garden stakes, zip ties and either shade cloth or marine grade fabric. Shade cloth is an outdoor fabric that partially blocks light based on the density of the fabric weave. The denser the weave, the more light that gets blocked. Shade cloth has the advantage of allowing wind to blow through the cloth so it is less likely to tear or be blow loose from the stakes. It can be purchased in a variety of grades to block from 30% to 90% of the sunlight ( see below photo). 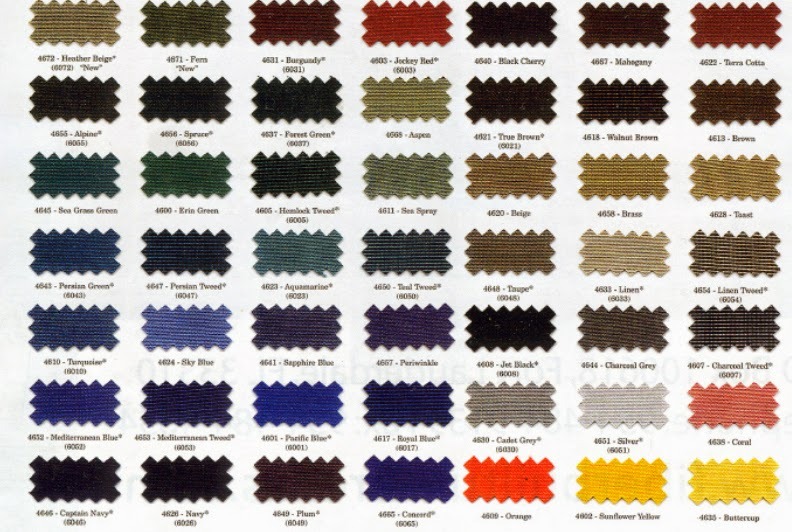 Unfortunately, your color choices are fairly limited -- your garden store is likely to only carry black, white and and green shade cloth. 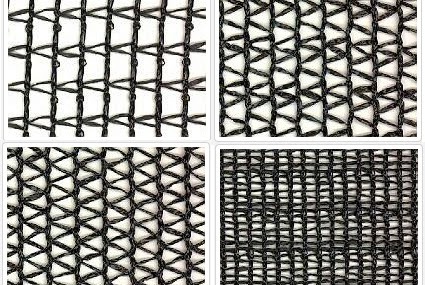 Marine grade fabric is a more visually appealing alternative. This is the same fabric used to make outdoor umbrellas and is UV resistant and easy to keep clean. 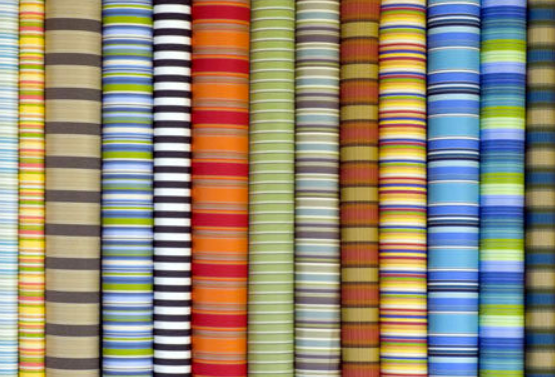 It comes in a very wide variety of colors and in many beautiful patterns. You can purchase it in small quantities from online retailers and local fabric stores. If searching online, look for the "Sunbrella" brand. Plenty of Water - During the summer months, it's absolutely essential that you provide your flock with a constant source of clean water. 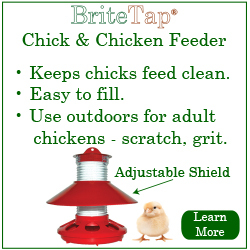 If you are using an insulated water water supply tank with your BriteTap chicken waterer, then consider adding some ice to the tank when you fill it each morning. The insulated tank will keep your chicken's water amazingly cool all day, even in extreme conditions. Some owners of the BriteTap chicken waterer tell us that they prefer using a re-usable ice block like the one shown below in place of ice. The blocks can be placed into the freezer each evening and are ready to go the following morning. There's no need to re-fill ice trays to make new ice.